Help : The Tax Rate Window defines the different taxes used for each tax category. 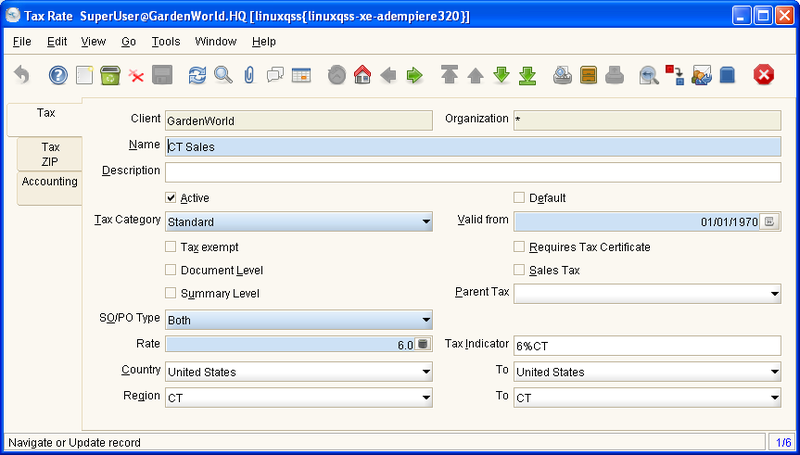 For example, Sales Tax must be defined for each State in which it applies. If you have multiple taxes, create a summary level tax with the approximate total tax rate and the actual tax rates pointing to the summary level tax as their parent. When entering the order or invoice lines, the tax is estimated, the correct tax is calculated when the document is processed. The tax is always calculated from the line net amount. If one tax has a the tax basis the line net amount and another tax, you need to adjust the percentage to result in the correct amount. Valid From/To is determined by the parent tax. Document Level Tax is calculated on document level (rather than line by line) If the tax is calculated on document level, all lines with that tax rate are added before calculating the total tax for the document. Otherwise the tax is calculated per line and then added. Due to rounding, the tax amount can differ. Help : The Accounting Tab defines the accounting parameters to be used for transactions referencing this Tax Rate.